So, I got v0.7.5 up and running and wanted to give some input. First, love the buildings that have been re-designed. Since the only underground structures that I got built were the Residential, I noticed that those hadn't changed yet, so I'm guessing that's something still on the drawing boards. The underground tubes look good. Nice utilitarian design. The surface structures look fantastic. The SEED structures look like they are slightly different, the mine heads are the same, but everything else is new and fresh. The new construction sites look more realistic, too. One thing I noticed was with the robots, in particular their placement on the tiles. When the graphic recycles to the start position, they are actually sitting on the tile to the left and they stop their movement in the middle. Was that intended or is it something that needs adjustment? I love that the movement is more fluid, not the stop-motion animation from the original. Did you alter the timing of the starship de-orbit and crash to happen sooner? Just seems like it's happening much earlier than before. At the top of the screen, starting from the left, I get the raw and refined materials icons. I also understand the food, power, and morale pictures, but my question was with the numbering of the food and power. You have it designated XXXX/XXXX. I just want to verify if I'm understanding it correctly. Do the numbers to the left of the slash represent the production level as it exists? And would that make the numbers to the right of the slash be representative of the needed level to sustain the colony? If I have this wrong, please clarify. My last observation for this post has to do with the terrain tiles. Their coloration seems to be pretty bright and almost monochromatic. It was a little difficult to see the difference between the Difficult and Impassable when they are adjacent. Same with the Easy and the Bulldozed tiles. They almost look alike. I like the smooth, uniform look of the original Bulldozed tiles. There was a definitely different appearance to them. Maybe bringing the color tone down a couple of notches, so that it's not quite as bright, and bring up the contrast some to make the different terrains stand out from one another. EDIT (leeor_net): Spaced paragraphs a bit more to make it easier to read, no changes made to content. Quick note: I opted to split this from where you originally posted this and create a new topic out of it. I hope the new title reflects what you intended with this post. JetMech1999, thanks for your feedback! It's always helpful to see what the end users think and your input will help to improve usability, play-ability and will influence documentation as the game is more complete. That stated, I wanted to address a few of your questions. We have about half of the structures replaced with new graphics. OPHD's development went onto the back burner for what, 9 months or so? White Claw took a bit of a break from creating new structure graphics while I dealt with real-life issues (like getting reemployed, paying down my debts, etc.) but with development starting to ramp up again and with the new release, I'm hoping to see some additional structure graphics in the coming releases. One thing I noticed was with the robots, in particular their placement on the tiles. When the graphic recycles to the start position, they are actually sitting on the tile to the left and they stop their movement in the middle. Was that intended or is it something that needs adjustment? I never adjusted the robot animations after we replaced the terrain graphics with higher resolution tiles. I never paid much attention to it but there are a few other structures that aren't aligned quite right either (these are the old visuals). I should prolly take care of that for the next release so at least they are centered on the tiles. Did you alter the timing of the starship de-orbit and crash to happen sooner? Just seems like it's happening much earlier than before. Yes. I came up with 24 turns from when you land your SEED Lander (so basically turn 25). This is roughly two years into your colony's development and I thought with an abandoned colony ship two years seemed reasonable to have it de-orbit though as dave_erald and others have stated, this may be too short. It should technically affect the power production from the SEED Power Facility as technically it gets power that's beamed down via microwave from the colony ship. Suffice it to say, I'll be implementing that by v0.8.0. The 24 turns is probably what very high difficulty levels will do (I'm kinda going with very high difficulty and lowering it via modifiers later in development). Hopefully this makes sense. I'm thinking for normal mode to have the ship de-orbit after 5 years (so 60 turns). It's AVAILABLE vs CAPACITY... e.g., what amount is available for use vs. what your total capacity is. For example, say you have a Fusion Reactor built (and it is the only power producer in your colony). It will generate 1000 units of energy per turn. So your total capacity is 1000, but your colony uses power (for the sake of argument it uses 100 units of power per turn. So the first number will be 900 showing you what power you still have available. This is true of all numbers you see in the XXXX/XXXX format: available/capacity. The NEEDED numbers aren't yet available for display. That'll be part of the Reports interface which, if things go according to plan, should be available for v0.7.9. I agree. There's mostly a contrast issue with this. As I'm somewhat colorblind I have to rely on the input of the end users and artists to help improve that. For me I can see it well enough and it helps that I'm intimately familiar with the visuals themselves so it's an easy cue for me (by shape). White Claw has done some work on updated tiles... color scheming is a little more difficult and will probably take a bit of time to get right. Thanks for your feedback! Please don't hesitate to speak up if you come across anything else that could use clarification, polish, etc. Thanks for the info. I think you moving my comments into this new thread was great. Now that things are getting more playable and more in line with OPHD, rather than OP1 or 1.5, having this progress line is going to work out well. You had pointed out that some of the features demonstrate various difficulty levels. Is this something that you are incorporating into OPHD, so that newbies can start out at a less aggressive pace while the more experienced people can try their hand at more intensive colony-building? This latest release is really getting me excited for the official release of v1.0. I know there is still a long way to go, but it's looking great. I actually managed to get a colony up to turn 95 before it imploded. At that point I had enough housing for everyone, a park/reservoir, nursery, university, and a lab. I did notice that the lab can be built but isn't actually functional yet, so I'm guessing that's part of a future release. Everything in it's time, I can wait. Barely, but I can. I also noticed that while my mines were producing and the smelters were working, nothing was getting to the Storage Tanks. It's quite likely that it was simply because all of the resources were going to the facilities that needed them and nothing was left to put into the tanks. Not a big worry about that yet. When it comes to new structure graphics, I get it that this is a side project. We all have real jobs that get the bills paid, families to take care of, etc. What's come out so far is great, which means that the remaining ones will too, just going to take some time. You guys are doing a great job. It's been my great pleasure to give you my feedback, it's what makes things better. I've noticed a lot of games use Used/Capacity, rather than Available/Capacity. I suspect Used/Capacity would be more intuitive. I'm considering replacing it with a visual indicator instead of numbers, or maybe an inclusion... like the battery icons on smart phones. But that's also kinda where I got that from -- e.g., your battery icon doesn't tell you how much of your battery is used, it tells you how much capacity is remaining/available. Except they tend to grow in opposite directions. Colonies tend to get larger. Battery charge tends to drop. Battery power is a consumable resource, not a continuously renewable resource, like the output from a power plant would be. A stored food meter I could see working like that, though it might be a bit odd without a fixed maximum amount of storage. As long as the ratios are described, I'm good with however you want to display them. Hooman and Leeor, maybe a vertical graph showing a percentage of capacity. Since the colony would, ideally, continually be growing, the support structures would also have to be increased to keep up with demand. Therefore, the percentage shows you how much wiggle room you have before things start getting hairy. You could set a minimum-needed point on the graph and anything below that point would either go red (or whatever color you might choose), or it could maybe bring up an exclamation point next to the graph that points out, "Hey, are you in there? This is getting really low. Your people are about to die!". I'm not sure the majority of end-users would care whether or not they are approaching the maximum, but I'm pretty sure they'd want to know they're about to bottom out. A percentage bar simply shows whether you're good or not. Or, you could just do how Outpost 2 does it: Show only a single value on the main interface, and have the capacity located in a separate menu. That's what's known as Bad UI DesignTM. Not as bad as Outpost but for the user to have to go and dig through menus to find it is usually a horrible idea. I'm thinking just the meters and hovering over the meter presents more specific information. Will have to play with it a bit and see how it feels. It is also bad UI design to put a whole lot of useless information on the main interface that isn't useful to the user in making decisions, forcing them to sift through what numbers on the main screen are useful to them or not. In most RTSs and Turn-Based Strategies, maximum capacity is useless information, unless it has a significant impact on your decision making. The only time I would find maximum storage useful is in a game like StarCraft, where it is used for the Unit Cap, to tell you if you can build another Siege Tank or if you need to save up and build a Supply Depot instead. The only other time the "maximum" value is useful, is when it is dealing with your health points in an RPG, where you want to know if you should drink a healing potion or not. Now, if you wanted the player to know that they were approaching maximum capacity, you could give them some indicator, such as a popup or an event message, or even a flashing indicator on the UI, to indicate nearing maximum capacity. However, most of the time, the player does not need to know the maximum capacity of a resource; the only time it is useful, is when they are nearing that maximum capacity; otherwise it is useless information that is only useful in a very small number of circumstances. Thus, it should be put elsewhere; it is still important enough to retain that piece of information, its just not important enough to place it on the main interface. In order for an interface to be intuitive and easily understood, only the most critical information, that is needed for the moment to moment choices a player will make, should be on the main interface. So, like Outpost 2, you could have a Resource Tab on the main interface side-bar, that could give a rundown of all your production and all your capacities. I agree that the maximum level isn't all that important but, as an end-user, I'm looking for something like a Heads-Up Display where the relevant information is always there. Where is my power level at, how much food do I have, what do the people think of me, what levels are my supplies at. While the current UI isn't great, it does do a good job of giving me what I need to keep myself out of trouble (usually). And if there is a shortage, I know where to go to find the information I need. It minimizes my time away from building my little empire, and does a pretty good job of maximizing my efforts. Yes, the UI needs tweaked, we all know that. But, it works. I don't see the need to throw it out the window. If the functionality stays simple, and gives the relevant information, it will draw more users to it. Once it's working, then comes the task of making it pretty and putting in bells and whistles, if that's the direction that users start wanting. It is also bad UI design to put a whole lot of useless information on the main interface that isn't useful to the user in making decisions, forcing them to sift through what numbers on the main screen are useful to them or not. Yes and no. Depends on the context, really. In most RTSs and Turn-Based Strategies, maximum capacity is useless information, unless it has a significant impact on your decision making. This isn't most RTS's and TBS's. This is Outpost. Storage capacity is extremely important to be aware of because if you run out of storage space you can find yourself running out of a particular resource and ending up collapsing your colony in just a few turns. Because of this knowing at a glance where your capacity is critical. Kind of like Morale and residential capacity (granted residential is hidden in the Population Panel which is opened by hovering over it). The same could be said about resources -- capacity could be 'hidden' in a Resources Panel which provides more information when the user hovers over it (something I want to do anyway). Again, yes and no. Depends on context. Outpost is not Outpost 2 -- they're two totally different games. In OP2, resources weren't critical to structures operating -- they only affected what you could build in the moment. In Outpost, each structure has resource requirements be they raw resources like metals and/or minerals, food, population, etc. If any of these resources become unavailable you could wind up in a colony collapse within a few turns. The HUD was basically what I was going for, a minimalistic approach that provided the information the user needed. Mostly it grew out of needing to know where the simulation was without having to stop and inspect values in memory in the debugger. I think tweaks will make the top HUD bar much more useful and easier to understand with pull down panels like the population panels for additional/more detailed information. I'm still leaning toward capacity bars like battery icons on a phone with the pull down panels on hover. Would be less busy (e.g., fewer numbers to compare) with a very clear visual indication... but again, have to play with it a bit to decide for sure if it works well or not. Lastly, I think JetMech1999 hit the nail on the head -- the UI is rudimentary and rough in purpose. I didn't want to spend too much time on it until more of the game was finished. But we're getting to the point now where some effort needs to be put into the UI. See the UI sub-board for discussions relating to that. I'm all for feedback as I'm a terrible UI designer. I've never heard of someone saying that they like an interface cluttered with useless information or near useless information as they try to determine what is or isn't useful. Could you give me a context of where having tons and tons of information on the UI makes the UI intuitive and easy to use, because I can't think of any game that got that right; I can name a ton of games (I should name some = Command&Conquer Tiberium Wars, Dark Reign 1, Rimworld, Spacebase DF9, Supreme Commander 1, Master of Orion 3, Starlords 2, Civilization 5 Beyond Earth, Earth 2150, No Mans Sky, and Planetary Annihilation to name a few) that put too much info on the screen and made the UI hell to use, but can't name any that had a cluttered UI that was useful. I may be misunderstanding you, leeor_net, but the problem you describe isn't about maximum capacities; it is about the total resource drain per turn. If the player knew that their total metal drain was 2800, and their production was 1500, then they'd be losing 1300 metal per turn. Knowing your maximum capacity wouldn't be useful information, in this situation. Alternatively, if their drain was 1500, and their production 3000, then they'd be storing 1500 per turn, a net gain. In that single situation, knowing how much capacity you have would tell you when you would reach your limits. ... Unless you stating that as a resource is consumed, so is the storage space that contains it and thus you need to build new storage space to replace the ones lost? If that is the case, that is counter-intuitive, which is why I don't think it is the case. I'd suggest that instead of concerning yourself with how much your capacity is on the main UI, you instead place the total drain of a resource next to your current resource on the UI, and place the maximum capacity elsewhere. If the player knows that their current production exceeds their needs, then they would look up their total capacity, to determine how soon they would reach capacity or maybe decide to increase resource consumption to pull the number down. Otherwise, it is useless info to have capacity on the main interface. 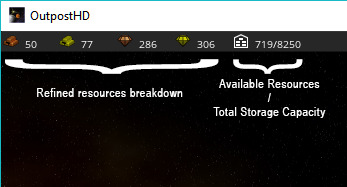 Current resources and current consumption of resources on the main UI, yes. Capacity on the main UI, no. Sounds like a lot of overcomplexity, for resource upkeeps, that detract from the gameplay. Are you sure that this stuff, that can easily wipe out a colony, due to sheer carelessness on a player's part actually improves the gameplay experience by having them there? Just because the original Outpost had some feature, doesn't mean it was implemented properly or adds to the experience, in fact I'm sure there are several things in the original that didn't make much sense. Anyway, that is my feedback and opinion. Hmm, some surprisingly strong opinions expressed in this thread. lordpalandus does make an interesting point about the resource level and the rate of change being important. I played A Dark Room (web based text game), where you collect and use resources. There is no maximum resource cap. You can deploy villagers to collect certain resources, or to transform one resource into another. You can see your current resource levels, though I often found myself hovering over each item to see the rate of change for each resource. Too much conversion effort can drain one resource, leading to wasted labour, as there is insufficient input resource for the conversion. In hindsight, knowing the resource drain/creation rate at a glance right on the main UI would have been very useful. I agree, Hooman, about the strong opinions. Feedback is great, even criticism and comparison to other simulations/games is helpful as long as the goal is to assist, not redirect. You mentioned about hovering over an item to get additional information. I think that's a good comparison to the Status Report that can be pulled up for Mines, Factories, Labs, etc. The main page information should give you quick altitude, attitude, and heading information in case a quick change is needed. Working in the aviation industry, I tend to refer to things in those terms. I view the information on the main screen as my primary flight instruments, which keep the plane flying the way the pilot intends. When something starts happening to other systems, new symbology is displayed that tells the pilot what is acting up. It also prioritizes them by importance, so that the pilot knows if he/she needs to address it immediately, soon, or if it's something that can wait until the plane is back on the ground. If it needs immediate attention, there are means to see more directly what is failing. The pilot can then make the necessary alterations to the airplane's configuration to assure safety and controllability. That's what I would view as the Status Report. Symbology can be programmed into the main screen UI to alert the user that something is out of balance. So, the Status Report could tell you that a mine is close to being played out, or that the agridome's water level is dropping. But at the "HUD", maybe you get a flashing light at the raw materials icon to show that something isn't acting quite right. People have given great inputs about what they'd like to see in functionality to OPHD. And Leeor has been big enough and humble enough to ask for help in the areas where he doesn't necessarily excel. In the end, we have to remember that OPHD is his baby. The only reason I bring this up is that some of the opinions expressed in OPU have come pretty close to personal attacks. I'm in no way saying that this is what's happening here. I have seen Hooman, White Claw, and others make some pretty bold statements both for and against the direction Leeor may be going at a given time. I've seen him change his direction because of some of those comments. I've also seen him stand firm on others because his vision of this sim was a little different than theirs. But in the end, the decision of what to implement is his. If someone has an alternate idea, I would encourage them to do what Leeor has done, and make a version according to their vision. I'm willing to bet that both would find followers. My personal opinion is the OPHD is already better than Outpost on many levels, and it hasn't even hit v1.0 yet. Sure there are a lot of things I would like to see in it, and nearly all of them are secondary to primary functionality. Movie scenes of the starship hurling through the atmosphere only to slam into the ground. Or scenes of asteroids pummeling the ground. Or even the fusion reactor blowing sky-high because of a critical failure. These are only three things running through my head, and not a single one of them relates to getting the sim up and running. They're fluff, something to make things more interesting. I almost suggested a water production facility until I remembered that's one of the functions of the CHAP. It's something that could be a secondary function of the agridomes as well. Thank you JetMech1999. It was indeed getting a little heated in here. Attached is a screenshot of A Dark Room, showing the resource display with a mouse hover box (for wood) for details. The most important part of the hover is the total, which shows the rate of resource change. It can be hard to get a sense of total resource usage and balance of villager allocation without knowing all those rates of change. I think the rate of change is important enough that it could be displayed on the main UI, right after the resource amounts, rather than hidden away in a mouse hover box. I like having the detailed breakdown of the total in the mouse hover box. It's just the total that I'd like to be able to see without needing the mouse hover. I could see such a display being useful when there is a produced/consumable resource, and production/consumption allocation needs balancing. Hooman, that's basically what I had in mind when hovering over some of the stats in the resource bar. It's not there yet but I've got a concept I want to play with a bit. ... Sure there are a lot of things I would like to see in it, and nearly all of them are secondary to primary functionality. Movie scenes of the starship hurling through the atmosphere only to slam into the ground. Or scenes of asteroids pummeling the ground. Or even the fusion reactor blowing sky-high because of a critical failure. These are only three things running through my head, and not a single one of them relates to getting the sim up and running. They're fluff, something to make things more interesting. I almost suggested a water production facility until I remembered that's one of the functions of the CHAP. It's something that could be a secondary function of the agridomes as well. I don't know if there will be FMV's of these events but I've given thought to how these kinds of events would play out and basically you'd see it actually happening on your map screen. The colony ship coming down? It crash lands somewhere on your map. After it crashes you might be able to send scouts to recover parts of the wreckage for research, resources, etc. Fusion reactor exploding? You'll see the building explode with the expected flash of light and parts flying around the map and damaging structures. Electrical storms? Yup. At least, that's the plan. It's for the later releases of v0.9.X and basically part of the polish I want to add to the game but I think it'll provide some effective visuals and atmosphere that the original game desperately needed but was way too far ahead of its time to be able to provide. Everything was going along pretty good. I added an Agridome around turn 61, which boosted the available food stores and morale started going up. Kept an eye on mine production. Rare metals dipped for one turn to 2 which came up the next turn. I had set up several Comm towers so that I could get other mines into production. I added another Storage Tank around Turn 65. Didn't matter, no materials were going into the tanks. I had added a Surface Factory, but once it was built, I had to idle it because the material load to produce Robodozers dug heavily into items I didn't have a lot of. I also added a Robot Command, so that the extra Robodozers that I had could be utilized. I sunk a fourth mine at around Turn 68, then on the next turn, the Rare Metals stockpile dropped to 5. When I advanced the turn again, the colony died. I can only presume that it was because of the lack of Rare Metals because all of the others were continuing to go up. Food production had increased so that it showed approximately 84/2050. At no point did the Storage Tanks ever get processed materials put into them. This was the first time I used the Ganymede planet type. I had previously only used the Mars type, but it really hasn't changed anything right now. Guessing the difficulty level was rather high for this run. Combine that with a resource-poor planet and things go south in a hurry. Unlike in Outpost, the Storage Tanks just increase your available storage pool for raw resources so you won't actually see anything stored in them. This was a deliberate decision. You are right in that your colony collapsed due to lack of Rare Metals. When that shuts down your CHAP fails as does your Fusion Reactor. If the fusion reactor goes down so does everything else which leads to an immediate game over. Robot production will take awhile because of how many resources you need to build robots. They're genuinely expensive. The Fusion Reactor and CHAP facilities will use a significant amount of Rare Metals. You should replace your SEED Smelter as soon as you have an opportunity as it's extremely inefficient. Build a second Smelter when you have an opportunity and you should see your Rare Metals pool start to grow. Make sure you stay ahead of the Resource Pool -- if you run out of space your colony will fail very quickly. This will be more manageable in future updates when you'll have the ability to instruct your mines what resources to focus on and you'll have the ability to dump excess resources if need be. Small hint -- your landers (cargo, SEED and colonist) are a good source of Rare Metals. Demolishing those after you've used them will give you a small boost to your resources for early game. Thanks, Leeor, for the information about the Storage Tanks. I took the long route but that was the core of my question. I had thought that the lack of product information was either a bug or that it hadn't yet been activated for the Tanks. In Outpost, I remember that when all of the Tanks were at maximum capacity, the resources would pile up at the Smelter or at the Factory. Then, when those ran out of room, the production facility would go idle, signaling a need for more storage space. But, since I'm not going to have the data on how full my Storage Tanks are, how would I know that I need to build more? Building them willy-nilly will use up considerable resources that could be used to build other support facilities or to maintain the supply pool to keep things running smoothly. I understand that the "HUD" provides me with where my metals and minerals levels are. Have you designed the Tanks for storing those items only, putting other manufactured items into the warehouses? Question. On the "HUD", do the metals and minerals icons represent the total available sitting in the Storage Tanks as well as the Smelters? The other thing I noticed was with the Smelters. When I opened up the Inspector on either the SEED Smelter or the other one that I had built, the only information regarding materials was in the far-left column. Is there supposed to be any other information in the other three columns? Since I started OPHD, I've only ever had data in the first column and nothing anywhere else. I hadn't yet built the Fusion Reactor, as at that point, I still had a significant surplus of power available, but I get what you're saying about keeping it fed properly and maintaining the resource levels appropriately to keep everything running. Thank you for reminding me about the resources provided by tearing down the landers. Started another session, using Mars type since it's the most resource-heavy right now. I've made it to Turn 177 without any major disasters. Ended up answering one of my own questions from my last post here, regarding the storage levels. I had some confusion about the house-shaped icon with the 5 blocks inside it, then I added up my resources and got my answer. One thing I didn't see this time was the spaceship crash at Turn 25 (24?). It also helped me with getting more Storage Tanks built. I currently have 12 and am nearly at capacity AGAIN. Of course, with 6 mines running and 4 smelters, things are looking really good right now. Both of my UG labs and the UG Commercial are disabled right now, though. Until the Status Report is made functional, I'm down to guessing why. My resource pool is very high, have plenty of power, good food supply. I also seemed to have jumped the gun a bit regarding the smelters as well. Once I had them up and running, I did notice that the far-right column now shows how much finished product is in storage there. So, what are the two middle columns for? In fact, I noticed that the status box for each structure shows the same columns but with nothing displayed. Are these just placeholders for when things get closer to complete? I only have one surface Factory running right now, and the only options from it are the digger, dozer, and miner. Do I need to build another factory in order to get the road materials, even though I don't really need them right now? It's obvious to me what they mean but that's only because I'm the developer. I know that this needs tweaking, it's on the todo list. In Outpost, I remember that when all of the Tanks were at maximum capacity, the resources would pile up at the Smelter or at the Factory. Then, when those ran out of room, the production facility would go idle, signaling a need for more storage space. Mines produce ores -- ores are stored internally in a resource pool at the mine. Each turn, a specified amount of those ores are transferred from the mine to the smelters where they're stored locally at at the smelter in an ore resource pool. Each turn, the smelter pulls a specified amount of ore from its pool which it smelts into refined resources at a given rate (somewhere around half... so 10 ore would produce 5 refined resources). But, it must have enough ore to pull... so if there are only 8 units of ore, it won't pull ore for that turn until it has enough (currently it's set at 20). That's why there are some turns when there seems to be no production from the smelter. Have you designed the Tanks for storing those items only, putting other manufactured items into the warehouses? Correct -- storage tanks are only for refined resources, not for products. Warehouses are for products like robots, road materials, clothing, medicine, etc. I currently have 12 and am nearly at capacity AGAIN. Of course, with 6 mines running and 4 smelters, things are looking really good right now. Might be over doing it a bit there with that many mines and smelters. Both of my UG labs and the UG Commercial are disabled right now, though. Until the Status Report is made functional, I'm down to guessing why. My resource pool is very high, have plenty of power, good food supply. Probably a population issue. Structures will go disabled if they don't have enough resources and/or people to operate them. Build at least one university to ensure you have scientists (no universities means only workers which is generally a bad thing). If you build too quickly you won't have enough people to operate all your structures. And yeah, it's kind of a guessing game at this point. It's something that I hope to have ironed out in the next couple of releases. That window is more of a debugging tool for me. What it shows are the two resources pools that each structure may take advantage of. The 'PRODUCTION' pool and the 'STORAGE' pool. It mostly makes sense with Mine's and Smelters which shows the 'incoming' resources (what's in production) versus what's in 'storage' for that structure. What that means is different depending on the structure. The takeaway from this is that basically, the Structure Inspector window is purely a debugging tool and isn't very useful to the end user. It will either disappear entirely or be completely redesigned in future releases. This is a result of an unfinished game. The surface factories can only build the three robots (though they're capable of building other things too). I haven't enabled the other products yet because the game doesn't do anything with them yet except store them in warehouses. Future updates will fix this. I get what you're saying about the mines and smelters. For this test, I wanted to make sure that I had more than enough materials to make things viable. Not a realistic construction model, I know. I would probably be good with three or four mines and two smelters. As far as the storage tanks, once I started building them, my available materials went through the roof. I was at around 9000+ available to something like 12500 capacity and the available was still going up. I have 33 scientists, 46 workers, 37 students, 38 kids, and 1 retiree. I have one university, maybe I should build another, and maybe a hot lab on the surface. Since research hasn't been activated on the labs yet, would the labs just function as a repository for scientists, showing them there just not doing anything yet? Finally, I haven't had any of the mines play out yet. I would have figured that by turn 177 at least the first one would be ready to go down a level. At least this time I was doing something right. I don't think morale ever dropped below 500 and it's currently at 927, which is the best result I've had with OPHD. I haven't gotten very far in my attempt to learn C++, but I have looked at the code a few times, and some of it is making a little sense. Maybe if I took a stroll through there I might learn some more answers to questions I haven't come up with yet. Thanks for the coaching. I really appreciate it. The labs currently use up 5 scientists each. Universities 3, Medical Center's 2 and Nurseries 1. Until research is implemented building labs is a bit of a waste of population. One university is sufficient to train new scientists (at the moment). There's a 35% spawn rate for scientists (e.g., if a student is becoming an adult, 35% chance they become a scientist, 65% chance they become a worker). This is a number that needs a bit of tweaking and is unaffected by the number of universities. Future research will improve the rate as will difficulty settings (and probably other variables). The mines are basically stubs at this point. Eventually they will work like you find veins with set amounts of resources available from them and requiring extending them to get further at the resources there. They will tap out after time but at the moment they produce indefinitely.